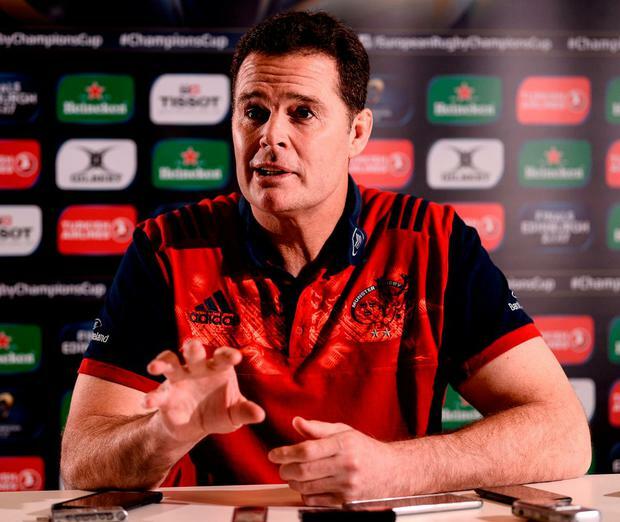 Rassie Erasmus has been in a similar position to David Nucifora and, if reports in South Africa are to be believed, he might be again sometime in the not too distant future. So, he can empathise with the decisions the IRFU's performance director makes in conjunction with Joe Schmidt as they look to manage the resources available to the Ireland team. That doesn't necessarily mean that he agrees. This week is supposed to be about Munster's return to the European top table, but instead yesterday's pre-match press conference was dominated by talk of Erasmus' own future and that of his star second-row. Ryan was Ireland's best lock in the Six Nations, but Nucifora and Schmidt decided his time as a centrally contracted player should come to an end in June. A reason for that decision has not been forthcoming from Lansdowne Road, so we can only speculate that a combination of age and injury profile meant they decided the 33-year-old didn't represent the future. Racing 92 were only too happy to part with a substantial amount of money to prise him away from his home province, who mustered their best two-year deal, but couldn't come close to matching the Parisians' offer. "If we had more money then we could have kept him," Erasmus conceded. "I don't think it's a matter of Donnacha chasing money. I think it's a tough situation for a guy like him, he is 33 years old. I don't want to speak on behalf of him, I'm sure he will say the same when you get to chat him. "He has probably got one big contract left in him. Rugby players just have a short-ish lifespan, earning enough money. "We gave him an offer of two years, and obviously a team like Racing has got more money, and I think he had to make a career decision which has not been confirmed yet. "When he loses his national contract the whole cost comes back to Munster, and unfortunately we can't afford to match that. He knows we wanted to keep him and we really tried our best. "I guess it is one of those things where you must be happy for him. If that's what he wants to do, he served this club well, he has done great things for this club. "Guys move on, like all the other greats, Ronan (O'Gara), all the other guys who eventually move on. You have to respect that and wish them all the best." If the IRFU are to continue their hard-line policy on expatriate players, then Ryan's illustrious international career will come to an end and Schmidt will lose a key player. Ireland's second-row options are not that strong, but the blow will be felt even harder at Munster, where the Nenagh man is a fulcrum of their pack. Erasmus believes he still had plenty to offer as a centrally contracted player. "Everyone has to accept… (the IRFU) also have a budget," he said. "They have an amount of money that must go into national contracts and if you've signed all the guys you feel must be your best guys and feel you're going to win Test matches with them and there's no money left, how do you cater for everybody? "It's not a matter of trying to convince and beg. There's only so much money and there's only so many players you can contract. In that way, we understand it and from a personal opinion, you might disagree, but that's besides the point. "We're sad to lose him, we would have loved to keep him. I think he's good enough for a national contract but I understand why they make those decisions. "We will be thin at second-row and we will have to make a few plans there. "Mark Chisholm hasn't played for a while and his contract comes up in June. Dave Foley has moved on. Jean Kleyn is going through a serious neck injury, he will be out for a few months. Billy (Holland) will always be there. "There's some young guys coming through like Darren O'Shea, but we'll have to bolster the squad for next year, that's definitely one of the positions we're a bit thinner." Whether Erasmus is here to guide Munster through that situation remains to be seen after he equivocated about his future yesterday. Although he said he intended to be in the same position next year, he also revealed that he has been regular contact with figures in South African rugby and has a break clause in his contract with the IRFU similar to the one that allowed Pat Lam leave Connacht a year early. Saturday's packed Thomond Park is testament to the work he has done so far since arriving in Ireland and Erasmus doesn't want his own "situation" acting as a distraction given the challenge of re-integrating his internationals for the crunch clash with Toulouse. "It is a challenge," he said. "Last week we gave Peter (O'Mahony), John Ryan and Niall Scannell a run against Zebre and you see small things are different in different teams… it was how things are coached differently and you could see last week it took a little bit of time to gel. "They had a little bit of a refresher (meeting) last night about the way we do things differently. "Intensity-wise it's a bit easier. They played England two weeks ago so the intensity will be up there but we have to make sure that they are 100pc in line with the way we want to play. "You have to understand that Monday and Tuesday will be scrappy and by Wednesday it clicks."